What is it? First of a new episodic Resident Evil. Resident Evil has gone episodic. I’m not really sure why, but it’s good to see Capcom experimenting with a series that has, let’s be honest, lost its way. The first episode of this Revelations sequel, titled Penal Colony, is out now on Steam, and for £5/$6 you get about two hours of decent, if not mindblowing, Resident Eviling. In the first half of Penal Colony you play as Claire Redfield, returning in her first starring role since Dreamcast favourite Code: Veronica. She’s joined by Moira Burton, the foul-mouthed teenage daughter of series mainstay Barry. Y’know, the one with the beard. Set in a gloomy asylum that wouldn’t look out of place in a Silent Hill game, the pair work together to escape the clutches of, well, whoever trapped them there. You can hit the Tab key to switch between characters. 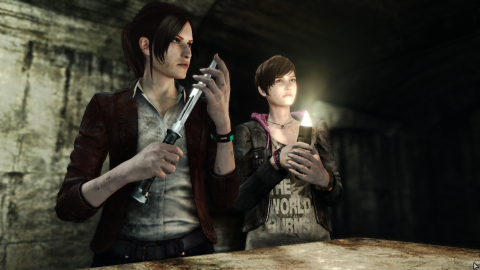 Claire handles the guns and a knife, while Moira lights the way with a flashlight and can whack zombies with a crowbar if she has to. As Moira you can stop zombies in their tracks by blinding them with her light. As Claire you can sneak up on them and kill them instantly. Your reward for a clean headshot is a pathetic splash of blood. Babysitting another character could've been frustrating, but luckily the AI is capable of looking after the character left under its control. But even if they’ve been grabbed by a zombie, you can just Tab back to them, break free, and clear some space between them and their attacker. It’s co-op fused with singleplayer, and it works well. The over-the-shoulder shooting will be familiar to anyone who played Resident Evil 4, but it’s a pale imitation. The feedback in Mikami’s game was brilliantly satisfying, with popping heads and fountains of gore. Here, the zombies barely react to being shot. Your reward for a clean headshot is a pathetic splash of blood. Compared to Resi 4’s punchy, kinetic combat, Revelations feels limp. So it's not as good as Resident Evil 4, then. But what is, really? The second part of Penal Colony sees you playing as Barry "the one with the beard" Burton, whose co-op partner is a little girl called Natalia. Claire begins her chapter with no weapons or supplies and has to scavenge them, but Barry starts fully kitted out with a pistol, an assault rifle, and his trademark Colt Python. Natalia can toss bricks to defend herself, ‘sense’ zombies through walls, and reveals hidden items. I like the co-op stuff. There are enough differences between Claire/Moira and Barry/Natalia that having multiple playable characters doesn’t feel like a shallow gimmick. Moments where they’re forced to split up raise the tension, and you don’t have to worry about the AI leading your partner to their doom. But boxy, uninspiring environments and weedy combat hold it back. As bad as Resident Evil 6 was, it at least felt like a big budget production. This has the unavoidable stink of a spin-off, and although there’s some nice lighting in places, the visuals feel outdated. It’s by no means the worst Resident Evil, but it doesn’t climb back to the series’ heights either. If you want to relive those days, play the HD remake. It runs fine on PC, with a decent selection of graphics options and support for high resolutions. The mouse and keyboard controls are slightly twitchy, and the camera occasionally freaks out when you sprint, but it’s just as playable as it is with a controller—which it was obviously designed for. Disappointingly, you can’t play through the story with a friend, either online or locally. Capcom has promised that online co-op is coming to Raid mode—which is similar to The Mercenaries—but the campaign is screaming out for multiplayer. Of course, this being PC, an enterprising modder has already started work on an offline co-op mod. The game is fun enough solo, but some multiplayer would have been welcome. As for the story, which is the driving force behind any good episodic game… well, it’s too early to tell. Not much happens in this two-hour slice, although the ending of Barry’s section did a pretty good job of making me want to play the next episode. I’m not entirely sure the episodic structure suits a game like this, but at least Capcom is trying something new to rejuvenate the series. I was intrigued by the ending, but it didn’t leave me with the same fevered need to play the next episode as a Telltale game.